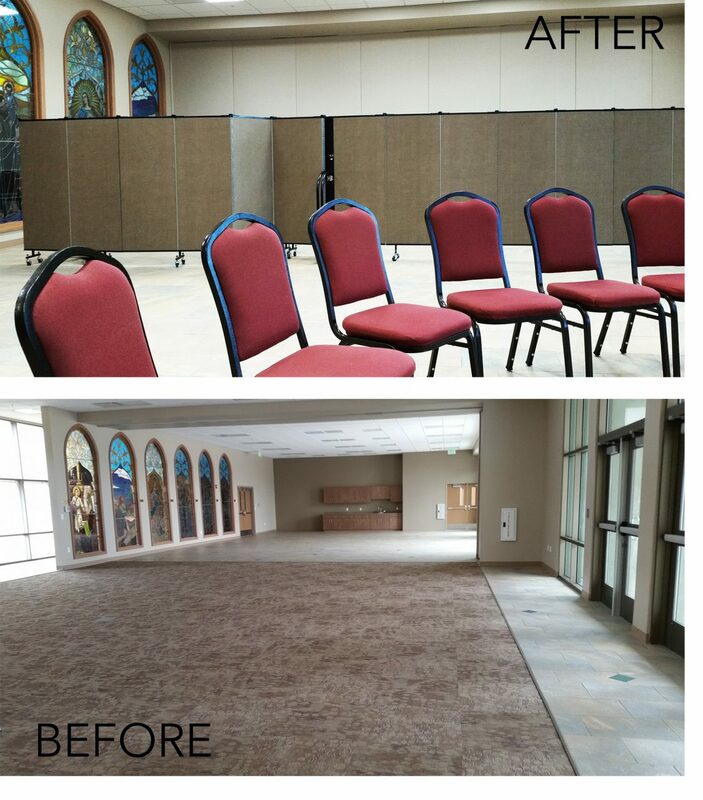 Uses: Multi Purpose Room, Religious Colors: Walnut Lengths: 11 panel 20'-5" Heights: 5'-0"
Since its humble beginning as a two-room church, St. Joseph Catholic Church has constructed two additions to its gorgeous facility including a 10,000 square feet building that seats 650 people. The entire east wall of the church displays magnificent stained glass windows depicting the creation story. 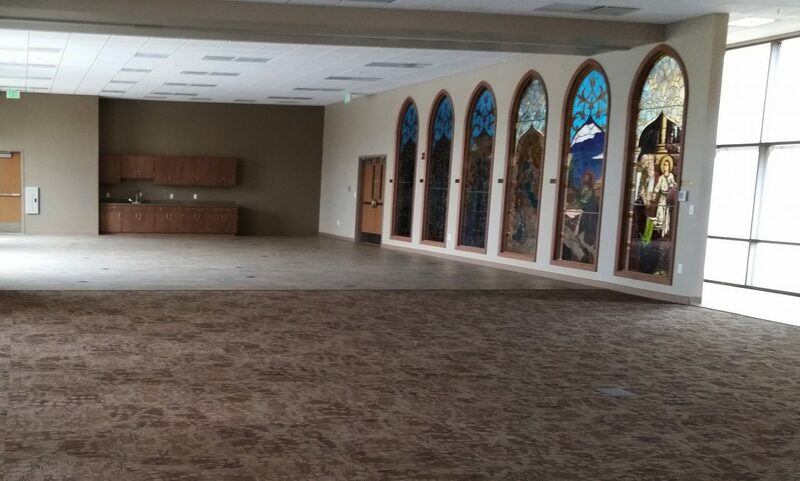 The stained glass windows capture the sun from the adjoining multi-purpose room. 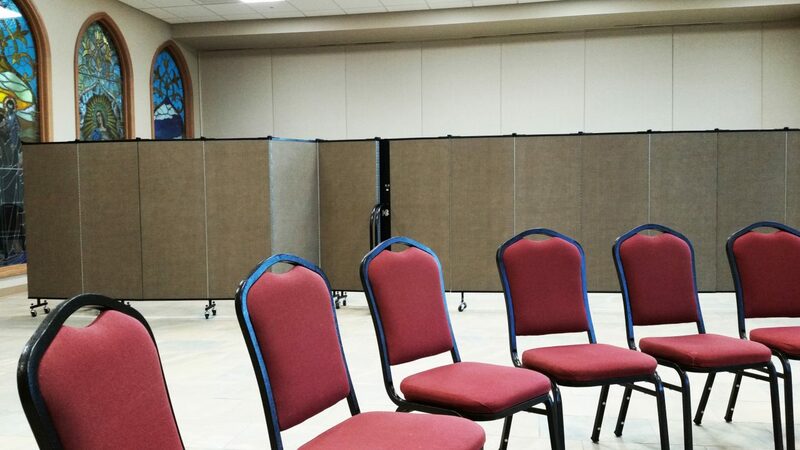 This multi-purpose room has also seen many changes since it was built in the 1990s, including the addition of Screenflex Portable Room Dividers. Why the use of portable dividers? The large space is used for many ministries throughout the week. The room needs to stay flexible in its abilities to adjust to the changing needs of the space, and Screenflex dividers do just that. “We absolutely love our dividers. We are using them in much more ways than I ever imagined. They are perfect and the quality is exceptional. Thank you for making such a wonderful product,” remarks St Joseph Catholic Church Staff. Can you think of more movable wall partition uses? Let us know your ideas!